It's difficult to write books for younger readers. Restricted vocabulary and simple sentence structure can lead to monotonous writing. However, judging by the popularity of the Judy Moody books, author Megan McDonald excels at writing junior novels to keep kids coming back for more. These chapter books have several features that make them perfect for younger readers. Large font and lots of white space stop the books from appearing intimidating. Each chapter is short, with most having very little narrative but plenty of dialogue and action. Peter Reynold's black and white, cartoonish illustrations really enhance the story and add humour to all the situations Judy finds herself in. Judy is a young lady with attitude who somehow manages to get into, and out of, lots of scrapes, leading to a whole series of books about her. 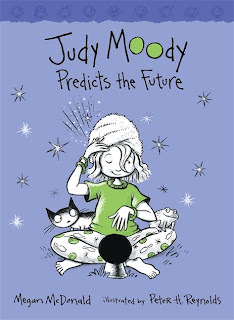 In Judy Moody Predicts the Future, her adventures revolve around a mood ring she discovers in her seventh bowl of cereal. Judy's interactions with other characters at home, school, or in the neighbourhood are all authentic - McDonald has a great ear and eye for children's interests and dialogue. I think Walker Books added a nice touch to the front cover - a sparkle-arkly crystal ball that Madame M (for Moody) is peering into! Although the strong girl hero (Judy) makes this a great book for girls, I believe boys and girls aged from 6 - 10 will enjoy this book, and go on to read more in the series. As a follow up to reading the book, children might like to explore the science of mood rings, look at predicting the weather or discuss whether any of us can really read minds (I swear my mother could!). Just for fun, see if kids can baffle Akinator, the web genius. And if you haven't made an origami fortune teller before, now would be a great time. Lucy, I'm sure you'll both love it.